Get a Reading with Robbie! Please call or text Robbie at 719-252-6375, or send her an email. Personal appointments with Robbie available in Pueblo, Colorado. Check out Robbie’s original oracle spread in The Twelve Steps of Recovery Spread! 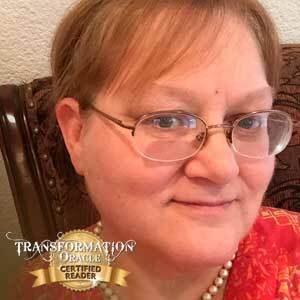 Learn how Robbie approaches life in her transformation story, Serving at the Divine Gate! "I was introduced to the Transformation Oracle by Certified reader Jeanette Peasley and fell in love with the artwork! When I attended the weekend workshop I was amazed at how the connection and interaction was with God, myself and the Transformation Oracle. I felt like had come home, that this was a big part of who I am but was never allowed to be myself. I felt alive and awake! Transformation is what I have been experiencing since that weekend and it’s gets better and better everyday! I encourage you who are reading this to try a reading, a class or just look through the artwork and see how the Transformation Oracle speaks to you!"